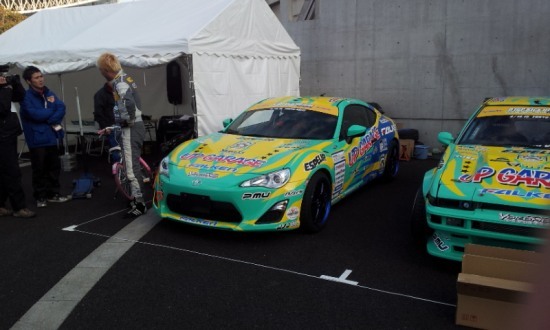 This is Tetsuya Hibino's Toyota 86 for D1GP. Project Mu brakes (Project µ): slotted rotors with 4-pot calipers at front, 2-pots at rear. It was first shown to public during Tokyo Auto Salon where D1GP kick-off event was held outside the exhibition. 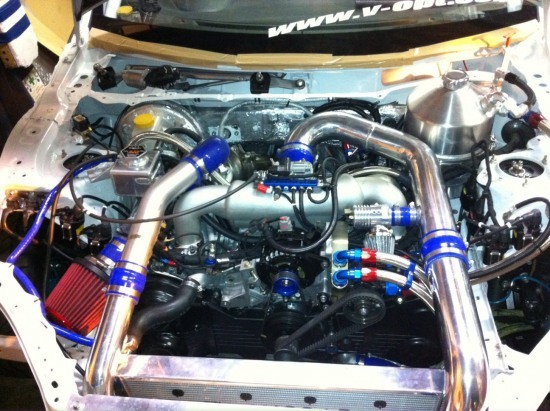 Cosworth EJ25 engine, 2.6L. 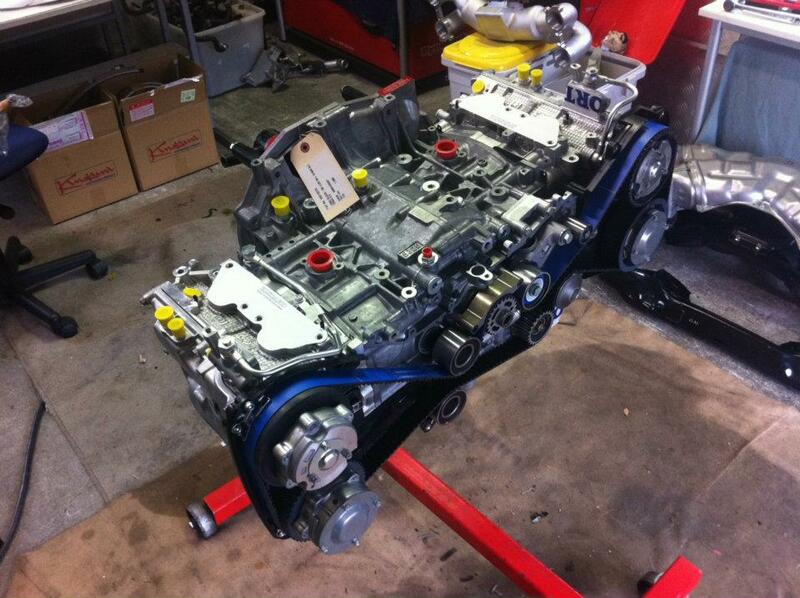 Will meet Hollinger sequential 6-speed gearbox. It was a couple of weeks back that I got an e-mail from Paul Hansen over at AVO America. He let me know that Ross at AVO Japan would be collaborating on a very special new D1 Grand Prix built together with the guys fromDroo-P. I instantly knew what he was talking about, it could have only been Hibino's Toyota 86 which will be replacing his old and trusty AE86 starting from next month at the first Round of the 2012 season in Odaiba. 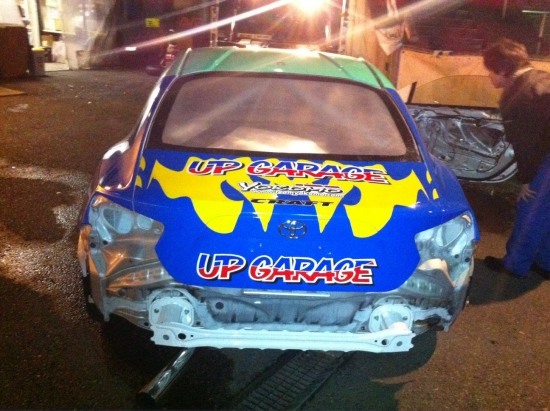 Ross told me the car would be sent up to his workshop once Droo-P down in Okayama would be done with the chassis prep, ready to accept one crazy EJ25 motor! 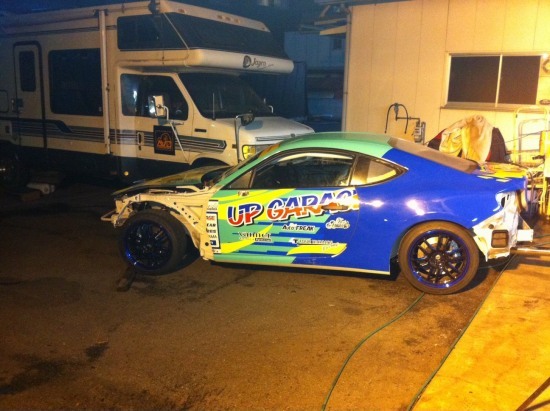 Up Garage, the Japanese second hand car parts chain store that has been providing good deals to car enthusiasts for years now, will continue to sponsor Hibino and his team, with Falken tire still on board for the season. 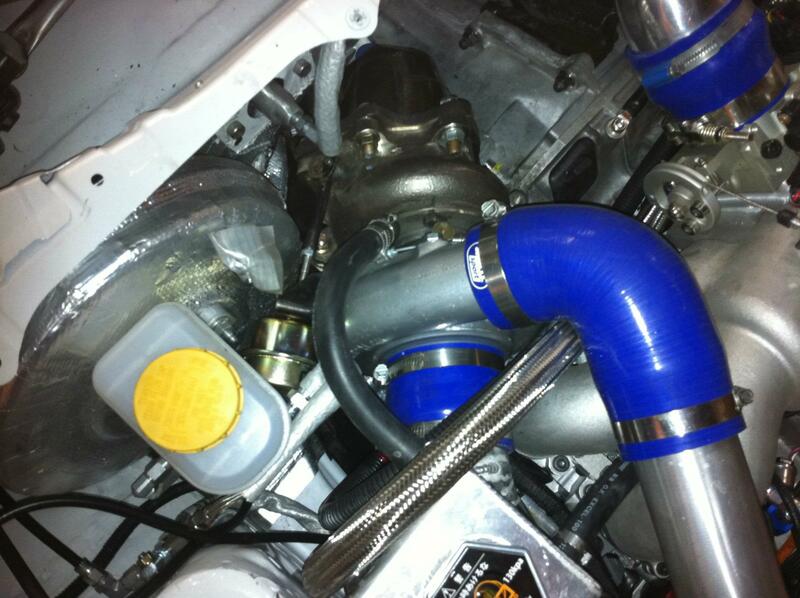 ...all custom made internals and an anti-surge attachment which will soon be added around the intake. 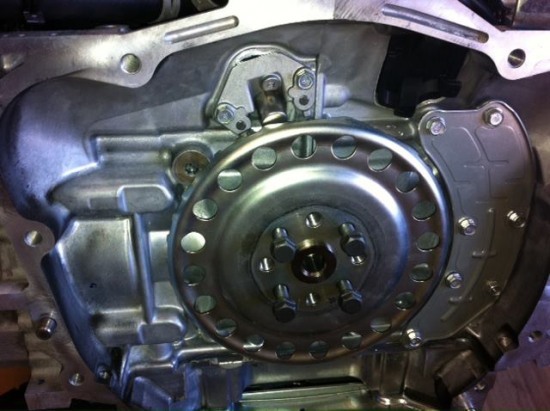 The EJ's 2.6 liters will have no problem spooling up the compact turbine housing, which is actually made from stainless steel so it can take much higher temperatures and is far more resistant to warping. Here is the view from the back, where the front pipe and exhaust system still have to be completed. 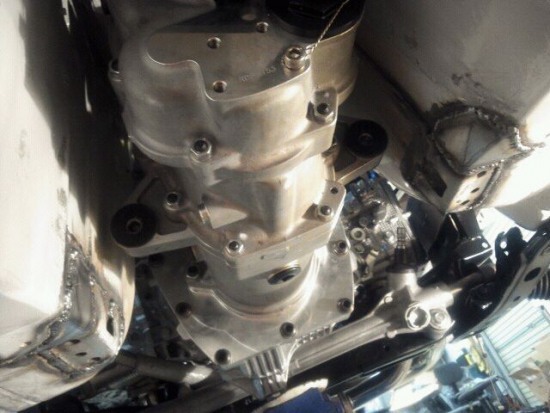 Ross kindly allowed me to have a detailed look of the 86 from underneath, where all sorts of interesting things can be observed, starting from the shiny stainless steel exhaust manifold. ...and of course an oil reservoir tank, a rather big one at that holding a massive 12L of the finest synthetic oil out there. Ross had just finished fabricating the billet fuel rails that supply the juice to the four 1000 cc/min injectors. 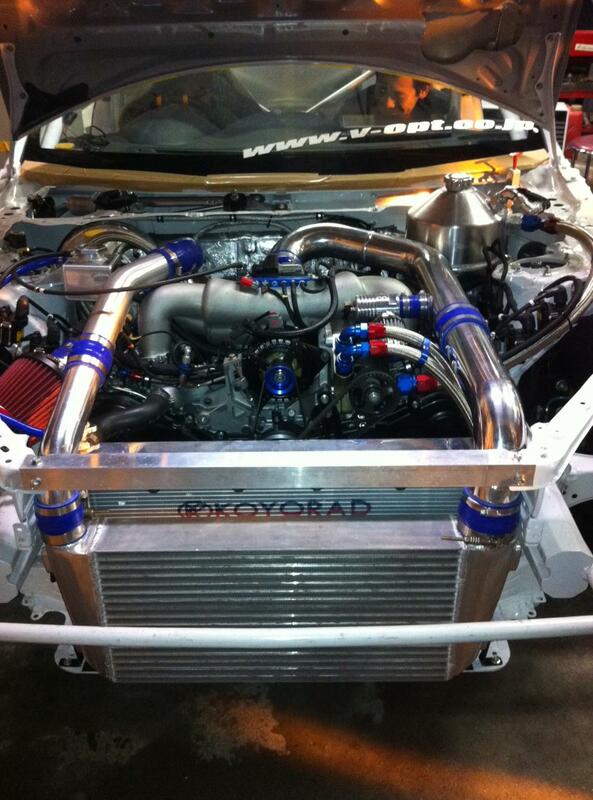 Koyo supplied the racing radiator, a custom part that even sported the above etched-on writing on it. Ross fabricated this custom intercooler set up with special end tanks that direct the piping upwards rather than around the corners of the front of the 86. The idea behind this is that if Hibino has a minor collision, or clips another car during a tsuiso battle, there is less of a chance of bending or damaging the piping. 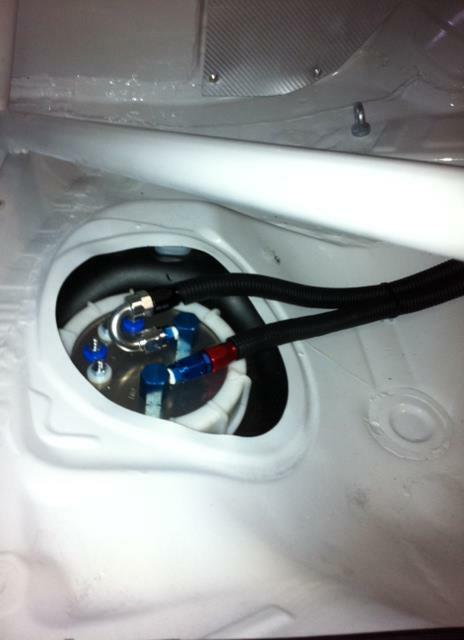 This solution of course also keeps piping short, which is always good for throttle response. Another special part from Cosworth is the intake manifold, a larger volume item mated to a larger diameter mechanical throttle body. ...along with the Link G4 ECU. 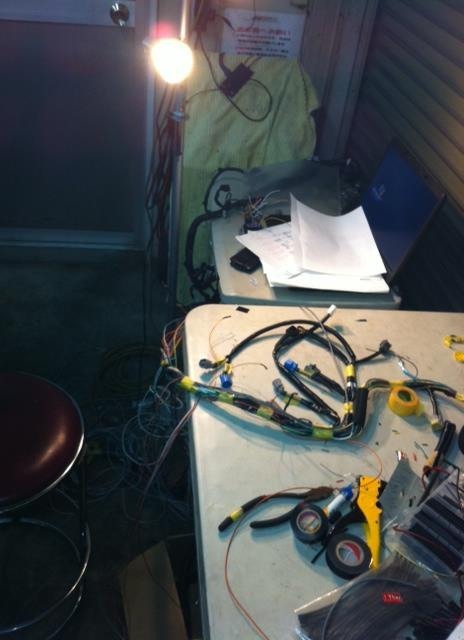 The custom wiring loom and electrical system was being painstakingly created on the day of my visit too, but more on that in Part 2. ...to data log as many parameters as possible in order to see how the engine, along with the rest of the ancillaries, behave under the stresses of drifting. ...with a very compact Hollinger 6-speed sequential. ...and the subframe that was fabricated to hold the sequential in place. 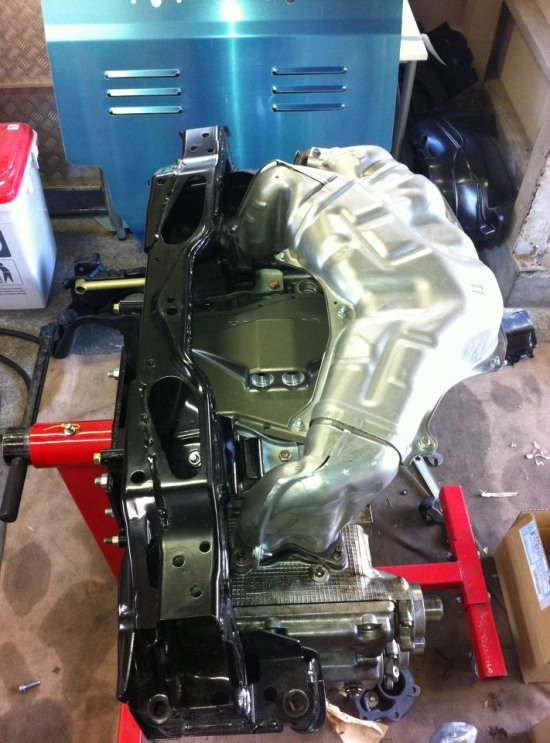 You can also see the rounded off section where the custom exhaust will pass through once completed. Taking care of the damping is an adjustable DG-5 suspension kit, which will no doubt require some fine-tuning once the car is finished and Hibino has a chance to drift it on track for the first time. 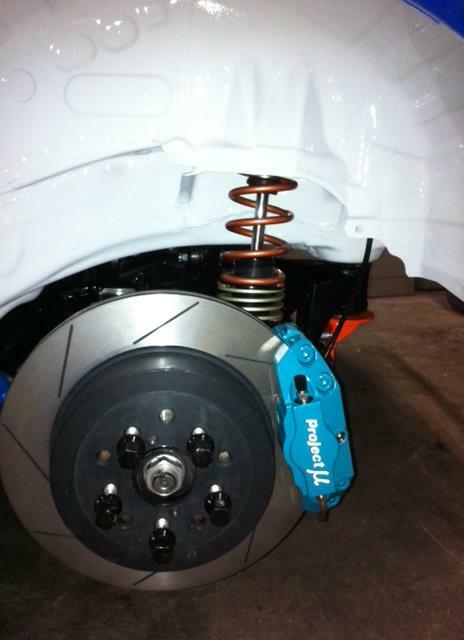 Project µ supplied the brakes with 4-pot calipers and 2-piece slotted rotors at the front. You can also see the hub extender which kind of hints that the car may be fitted with wider fenders, but I guess we won't find out if this is the case until the first round in Odaiba next month. In Part 2 we'll take a look at the rest of the car starting from the interior, which as you can see above has been fitted with a custom welded-in roll cage and a ton of other nice little gadgets. More on this Toyota 86 build soon! 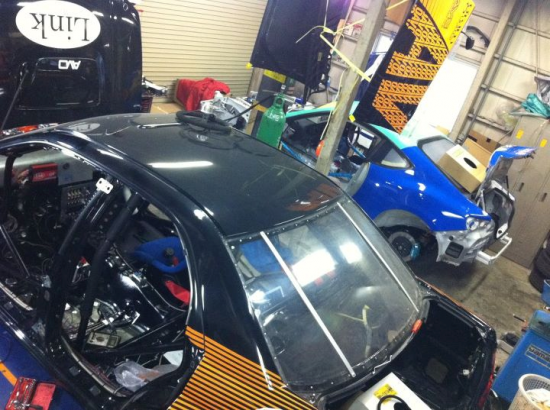 It's time to finish up taking a look at what has so far been the most extreme Toyota 86 build we have come across, and again many thanks have to go to Ross at AVO Japan, Paul at AVO America, Droo-P, Up Garage and all the other companies involved in the build of Hibino's 2012 D1 car. ...so let's concentrate on the more evident details starting off inside. Like we saw in Part 1 the interior has been completely stripped out and modified in specific areas like the transmission tunnel, boxed out in order to fit the Hollinger sequential. A custom linkage has been made for the shifter seeing the racing gearbox is far shorter and more compact than the stock unit. This of course also called for a modified propeller shaft but more on that further down. 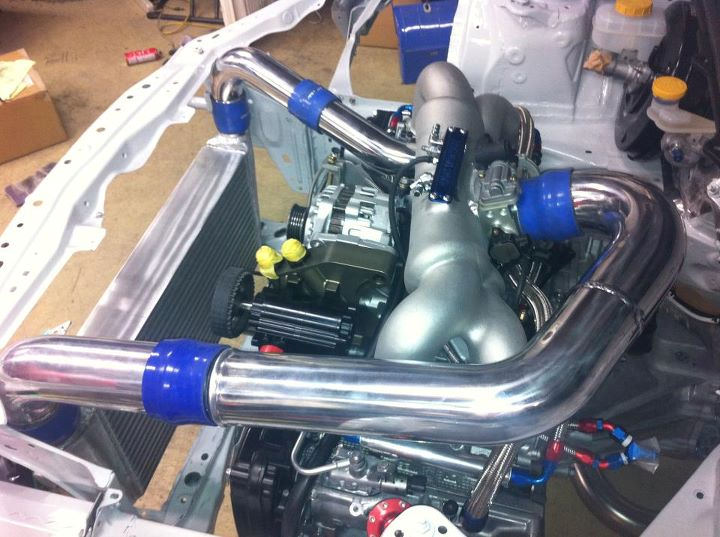 Here is a detail of the custom roll cage, gussets welded on to the B-pillars. Some of you noticed how the construction of the roll-cage differs to some of the more complex cages that are built in drift or race cars abroad. 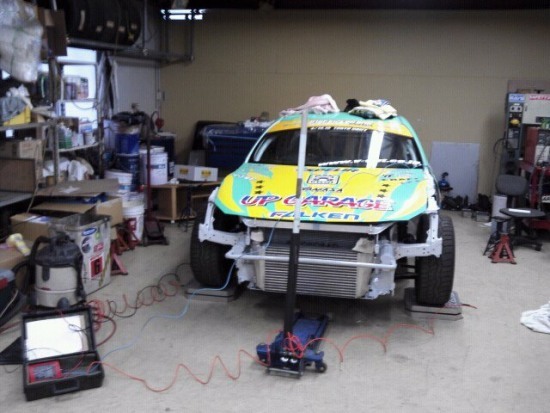 D1 doesn't specify any guidelines to roll-cage construction so it's up to the tuner to fabricate what he sees as the best cage for the application. 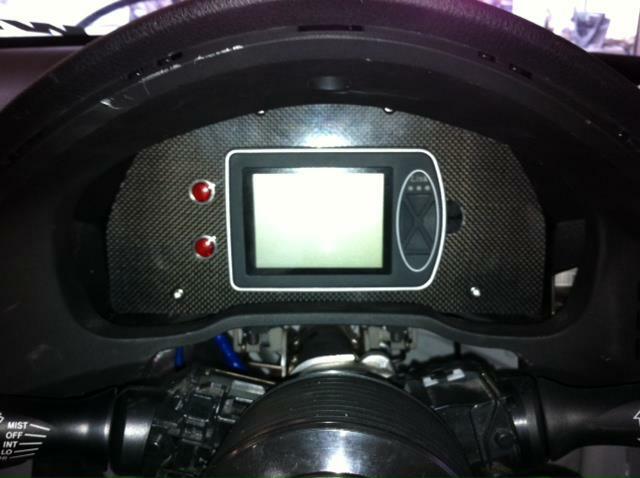 ...and the carbon fiber backing plate onto which the Link LCD dash unit and data logger would be fitted onto. There you go, perfect fit! 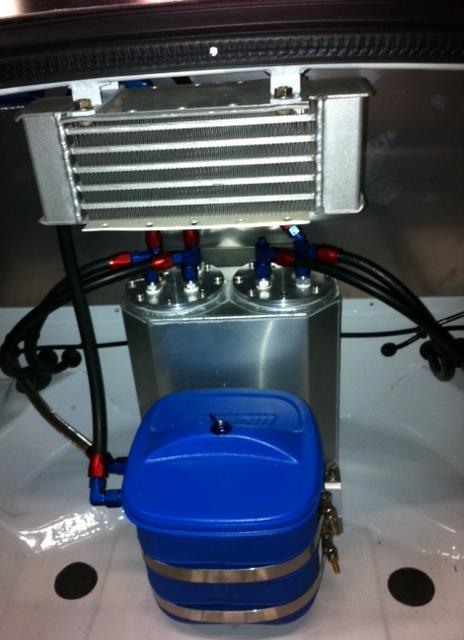 ...as well as this bucket-type cooler which is filled with ice, or even dry ice. 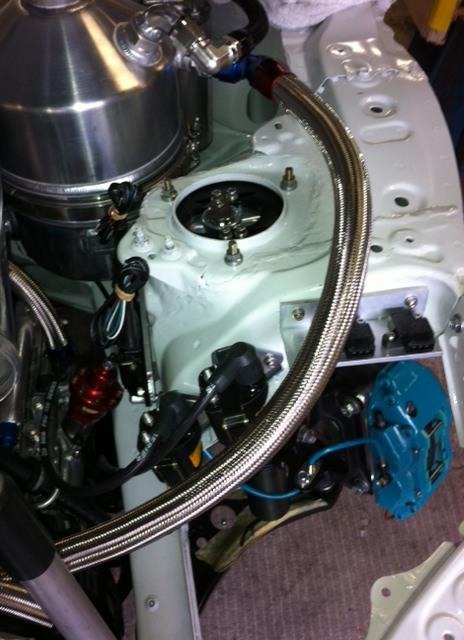 The big Optima Yellow Top battery has been fitted centrally in the back of the 86, where the stock rear seats would be. With most work almost complete it was the custom wiring loom that needed to be fitted and laid out around the chassis next. This is the mess of wires that are needed to make everything work, all measured and cut to just the right length and grouped together as required. ...John Marsh, or "Crazy Gaijin" as some Japanese started calling him during his time here, from AVO Australia flew up to Japan to take care of it all. He is a specialist in this field and was casually chatting to me while neatly organizing tiny wires together. Crazy stuff! Here is the almost completed loom! 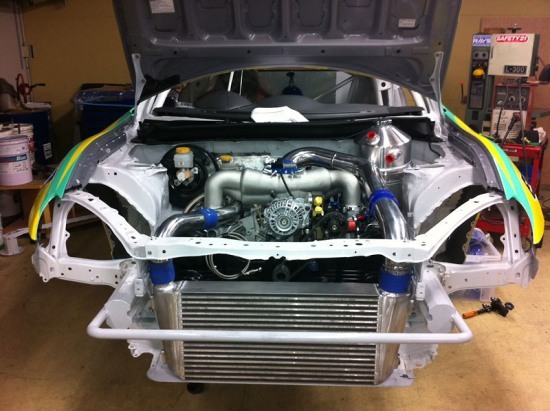 While I was buzzing around the workshop shooting pix of the 86 and AVO's GDB, Ross had shortened one piece of intercooler piping and was welding on an aluminum plate onto which temperature and pressure sensors would be fitted. Thankfully there was still a bit of snow left in front of the shop from a few days before which proved to be perfect for cooling the pipe down after welding. It was then on to drilling up three holes on the plate and threading them, ready to accept the sensors. With all of the tools and machines that AVO have at their fingertips this was all done in the space of ten minutes! ...and stock differential housing remain, but have been joined by a lot of other upgrades beginning first with the modified propshaft, and a Cusco 2 Way LSD. Again from Cusco are the adjustable pillow ball lower arms and traction rods. Here is a view of one of the rear DG-5 dampers, along with the Swift main spring and smaller helper spring. You can also spot the orange AVO polyurethane stabilizer bush deep inside the lower arm. 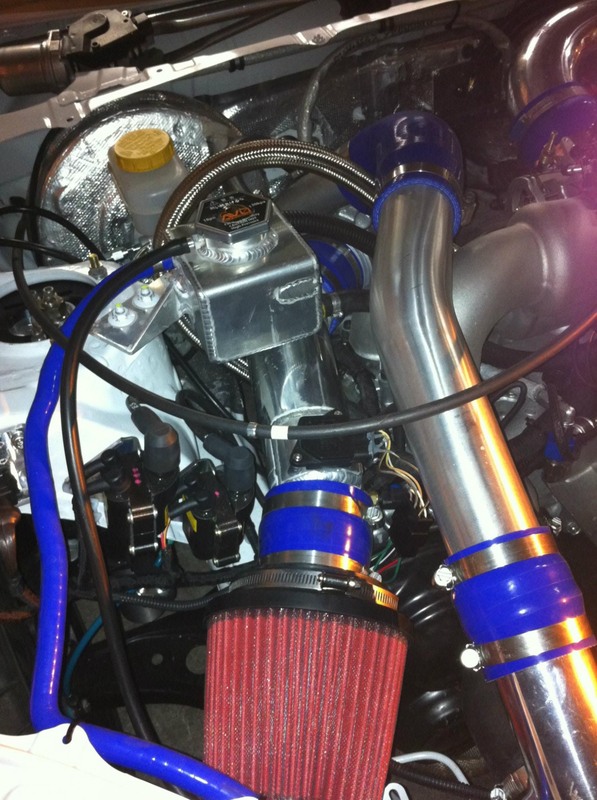 Another look at the Cusco parts. Cusco will have a complete lineup of parts available for the Toyota 86 and BRZ available from later on this month so those lucky enough to get their hands on one of these cars will be spoiled for choice from the get go on upgrade parts! AVO fitted their rear stabilizer reinforcement brackets, a mod I've been wanting to make to my Legacy for a while now. 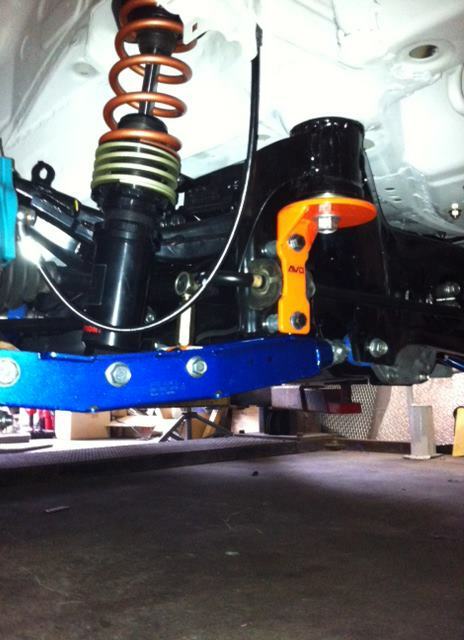 Like on Subarus, the 86's stabilizer mount is made from thin steel plating which bends under stress, throwing off the full effect of the stabilizer bar. This steel plate helps keep things nice and firm, giving a better feel from the rear end, improving things like mid-corner adjustability and turn in. ...not bad right? And to answer some of the questions from Part 1 as to why the Cosworth intake plenum hasn't been rotated 180º, the reason is simple. Ross wanted to do this to keep piping shorter and more direct but this can't be done due to the positioning of the mounting bracket of the Cosworth dry-sump oil pump which is right in the way. I can't wait to see this thing in action through the tight Odaiba course next month! 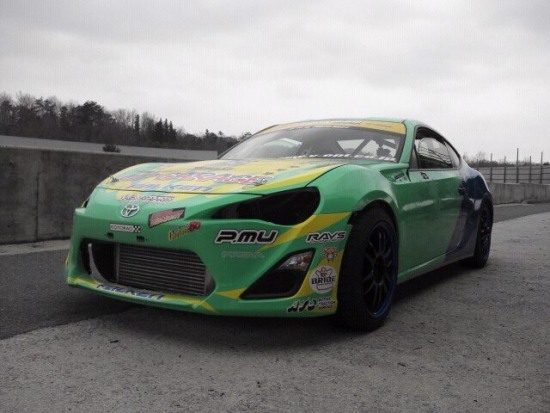 Don't forget this will be one of three Toyota 86 D1 cars; HKS are busy at work preparing Nob's machine ready for his return into the series and of course there is Orido's 86, powered by the Lexus ISF's 5L V8, which is in the final stages of the build. These cars will no doubt inject much needed excitement into the D1 Grand Prix, which has been struggling for years to attract the same big numbers of spectators it used to during its heyday. Tuning update on the Droo-P car - baseline tuning done. 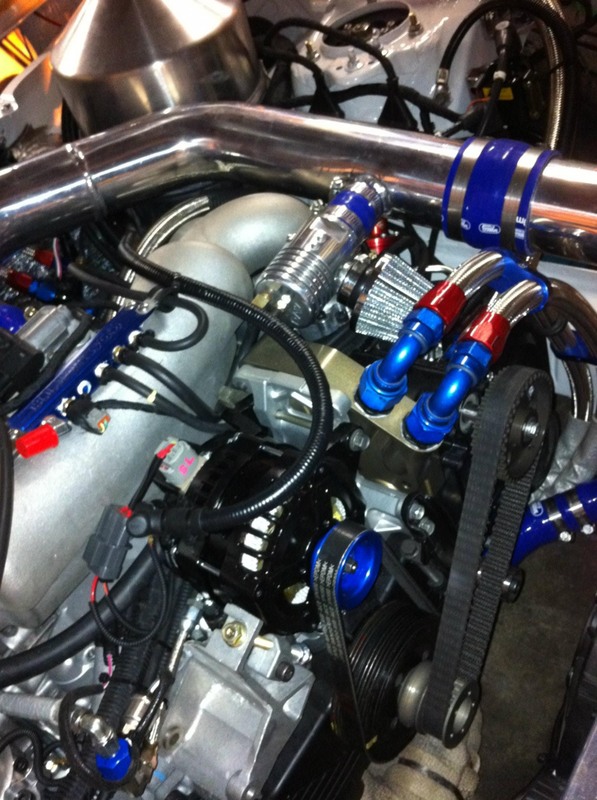 580whp (680ish at the engine) and 85kg of torque (605ft/lbs). just two weeks until we see this baby with full turbo power!